You must make reservations at least 5 minutes in advance of the time at Headquarters Restaurant. Free 2 hour parking available across at the Westman Village Parking or underground lyric parking. Please remember to input your license plate number before you leave. Notes of vanilla, lemon, lemon meringue pie, butter, and sometimes a hint of hay with rich and creamy mouth feel. Perfect with a creamy seafood pasta, halibut, lobster, butternut squash soup or a cold rainy November day! Crisp and nicely defined mouthfeel. Medium-bodied and showing the juicy. Perfect wine to enjoy with turkey dinner, roast chicken, or even garlic mussels! J.Lohr Petite Syrah "Tower Road"
Both of our meals were pretty bland. There was no flavour. I had the prawn cacciatore. Otherwise the service was good with a good selection of meals. My husband and our friends enjoyed our first time there. The music and piano was very nice. Our waitress was nice and service was good. I ordered the Mac and cheese with pulled pork it was tasty but not very much pulled pork and way to much topping. I ordered the panna cotta and was disappointed at the serving size and again it was covered in way too much pineapple out of a can and jam. It really didn’t allow me to enjoy the dessert. The atmosphere is perfect for a group of friends or a romantic date! The piano music was just the icing on the cake! Our server Angela was outstanding and made our dining experience the best! I believe there is huge potential for this restaurant. The food and service do not represent the ambiance or value. If this was meant to be fine dining, the food and wine menu were too simple and overpriced. the experience of the culinary staff and service staff do not measure up to most fine dining restaurants. Prepared and packaged food items are obvious. If given the proper time and staffing, it could become a fantastic restaurant. Kitchen staff should not be seen eating food in the customers view. Food was tasteless. Pork belly seemed reheated. Polenta fries were interesting but was not particularly tasty. Room is rather cavernous and not conducive to conversation. The service and live music was great. However, the limited menu left much to be desired. For the associated costs, the meals were mediocre. We wouldn’t be surprised to learn if the steak had been previously frozen. It was my friend’s birthday. He truly loved it. The pianist there played “happy birthday” for him. All in all it was a pleasant experience however I found it a little expensive. Food was really good. Horrible service, food forgotten to be brought out. no refills, Horrible cheap wine menu (by the glass) Server took forever to find to get the bill. I was vary impressed with the piano and the lay out of the place. Food I was NOT impressed with. Steak was dry and tough. 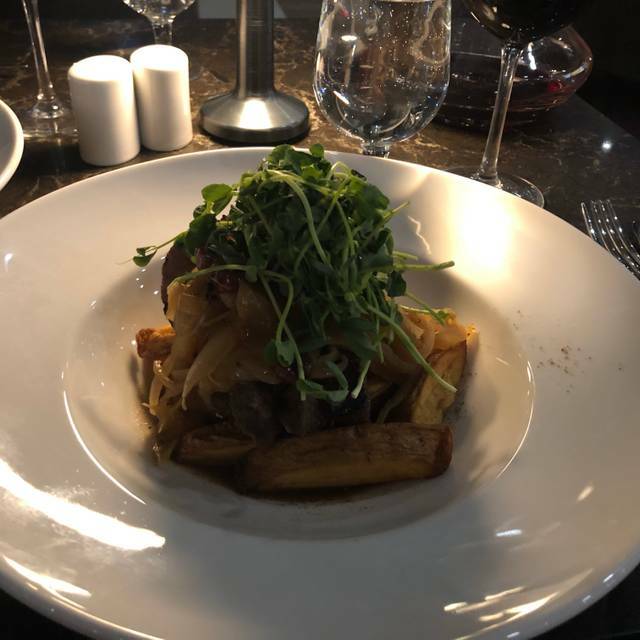 It was not worth the money, I had better steaks at a pub, I will give it one more chance, maybe just maybe I got a bad steak and I don’t like to see business fail so one more chance. I think HQ is trying and we wanted it to be a great experience, but the food was horrible. My wife and I shared the bococinni balls wrapped with prosciutto and chicken campales (sp). Both were just very bland. My wife then had the seafood risotto and I had the 10 oz striploin, her risotto was floating in butter, and the calamari was so rubbery. My 10oz striploin was about 7oz and was littered with fat. The environment was full of age 60 plus couples and groups, which is fine, but not our thing, couple in their 40's, we were by far the youngest eating. The table next to us complained about their food as well. Have been here before and the food was excellent. Tonight the food was very poor. The steak was very poorly cooked and was tough while my wife’s potatoes were not cooked and were hard. The live music was excellent!!! 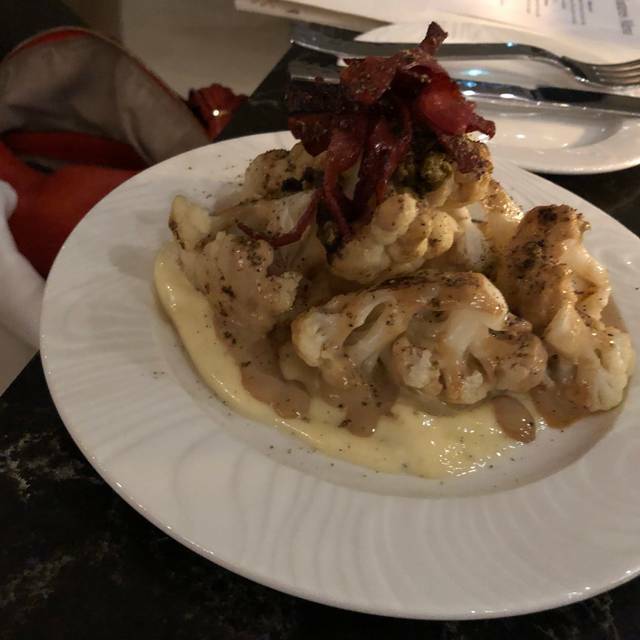 I don't often write reviews but as this restaurant is catering to a neighbourhood I live in I think my two cents can not only benefit future patrons but the restaurant itself. Let's hope. Free 2 hour underground parking, thumbs up. Greeting and table service, fantastic. Tapas menu, innovative and the Prosciutto Wrapped Basil Bocconcini was quite good. Nice wine list with fair pricing on 6/9oz glass options. She had; the Pesto Halibut, which was served in a bowl and was good but ordinary. I had; a worn-out piece of shoe leather that they attempted to pass off as the 10oz strip-loin special. Small, fatty, overcooked, flavourless, and cold. Reading the reviews before me around the same time, it seems to be a consistent issue. Better supplier, better cook(s), or both. Our table afforded me the ability to watch the kitchen scramble under the pressure of a busy Valentines seating and it was clear they were lacking experienced staff back there. The pianist was a pleasant distraction and nicely played to the crowd. Overall I liked it but didn't love it. I'll give it another 6 months and hopefully they can straighten out the kitchen and supply issues. In the meantime I'll try and get into Chairmans. My strip loan was tough and my wife’s chicken was tasteless. After so much hype, a disappointment... Piano playing and singing during a meal should be in the background not in your face. We had a wonderful Valentines dinner at HQ. The special occasion menu was delicious ... Steak done beautifully and the Salted Carmel cheese cake was amazing. Great wine and cocktail selection as well, topped off with fabulous service and a talented pianist. It was our first time and we will definitely return. Starters were delicious and the pianist was delightful but the mains were bland. The first time we went, we loved the food, the second time however, we felt like the food was just okay. The service was great both times and we really love the atmosphere. Signage for restaurant & for parking is poor. Food was average. Service was not great & it wasn’t even that busy. Live music was really loud, hard to have a conversation over dinner. We went for drinks and tapas. The live music was great, as was the food and service. We will be back! We really enjoyed the atmosphere and ambiance of Headquarters Restaurant. Although it has the look of a hotel lounge when you enter, it certainly does not have that feel. We really liked that the tables are not crammed together and you don’t feel like you can hear your neighbours conversations. The piano player accompanied by a singer were very good. And from where we sitting provided nice background music. The food was very good from the Tapas to the main courses our group of 4 really enjoyed our different dishes. The service was also very good. The staff work as a team and that is so great to see. Will go again for sure. Chef was very accommodating. As a vegan there was nothing on the menu however he was very kind to make something up for us. Food was worth the price, exquisite. Very nice decor and ambiance. Live piano followed with beautiful singing voices. Poor service. We were there 2.5 hours and didn’t even order appetizers. Took 1.5 hours to get our meal. Food was cold and not well seasoned. Loved the live music but awkwardly quiet when they took a break. Food was bland. Not well seasoned, and that was true of the steak, lamb shank and salmon. The starters were tasty. Service was inattentive. Dirty plates stayed a long time. Our experience was very good. Nice place, good ambiance and good service. Quick last minute lunch. Lovely space, great service and wine list. Had the chicken Cesar wrap which was slightly under dressed but still tasty. Polenta bites were quite good! Definitely would go back for dinner/ drinks. I was expecting a high end experience from this restaurant and initially the setting and service was good, but as the evening progressed, the overall experience greatly declined. The food was cold and tasteless, the service was slow and something as simple as a cappuccino took over 15 minutes to prepare. At the end of the evening the manager came by to ask us about our experience, but then provided excuses for every comment and asked us to come again. He obviously was not concerned about our experience and was going through the motions. I would certainly not recommend this restaurant as you will have a better experience at Swiss Chalet. It's a beautiful restaurant, loved the live music. The food was really disappointing. Went with two friends. Expected great food based on ambiance and menu prices. Both friends had fish and both said it was dry and bland. I had the flank steak which was super underwhelming, not seasoned at all, the potatoes with it were very undercooked. My husband, who doesn't cook much, would have cooked us a better meal. Lots of work to do Headquarters. 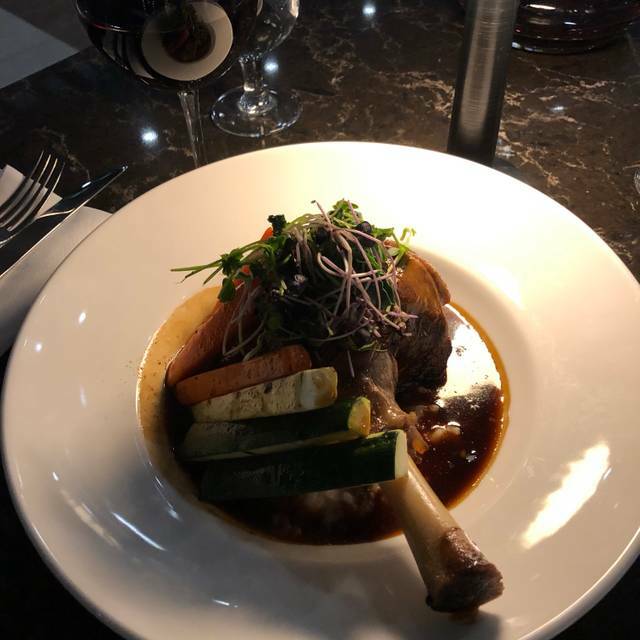 Delicious lamb shank! Very talented Carmen Lucia playing piano and singing created a wonderful ambiance. Great addition to south Calgary! Walked in and was pleasantly surprised by the piano and the talent of the girl playing. We had a date night here last Saturday and enjoyed a few tapas, as well as the lamb and steak for entrees. Both the tapas and entrees were generous portions with succulent flavour. The service was great and the live music was a bonus (think it’s only Fridays and Saturdays). Finally an upscale restaurant in the south, confirming we never have to leave the burbs ! My husband and I went for our anniversary and could not have been happier with our experience. The staff treated us like royalty and the live music was amazing. The couple sang and did piano and it was the perfect vibe and music. Highly recommend this restaurant! I will be going back here with some girlfriends very soon! 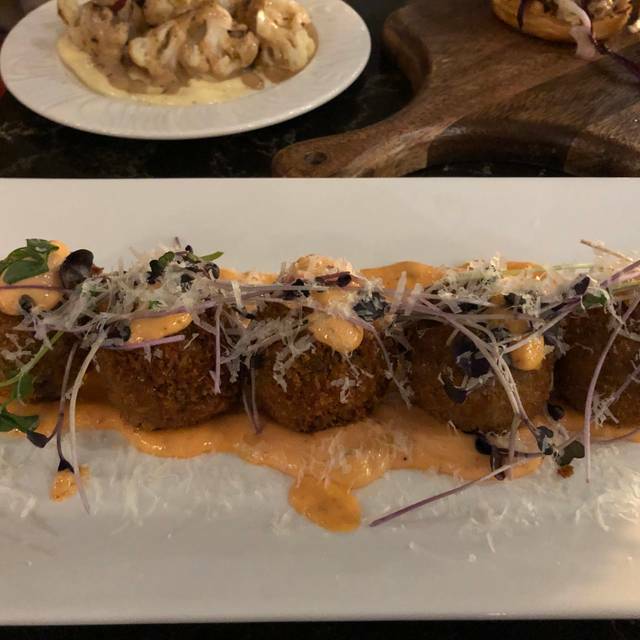 The service and food were both good, a fairly limited menu but tapas was nice, the meat in my entree was way over cooked but I would give it a second chance. More like a lounge than a dinner place, close proximity to independent living so an older crowd. Food was great, service was also pretty good. Duck and steak were very good from here! I don’t want to give a horrible review, but the experience and food was not what I had expected.